Image Credit: ESO, VLT, HAWK-I, H. Drass et al. Explanation: The deepest infrared image of the Orion Nebula has uncovered a bonanza of previously unknown low-mass stars and -- quite possibly -- free floating planets. The picturesque nebula is best known in visible light where it shows a many bright stars and bright glowing gas. Catalogued as M42, the Orion Nebula at a distance of 1300 light years is the closest major star forming region to Earth. 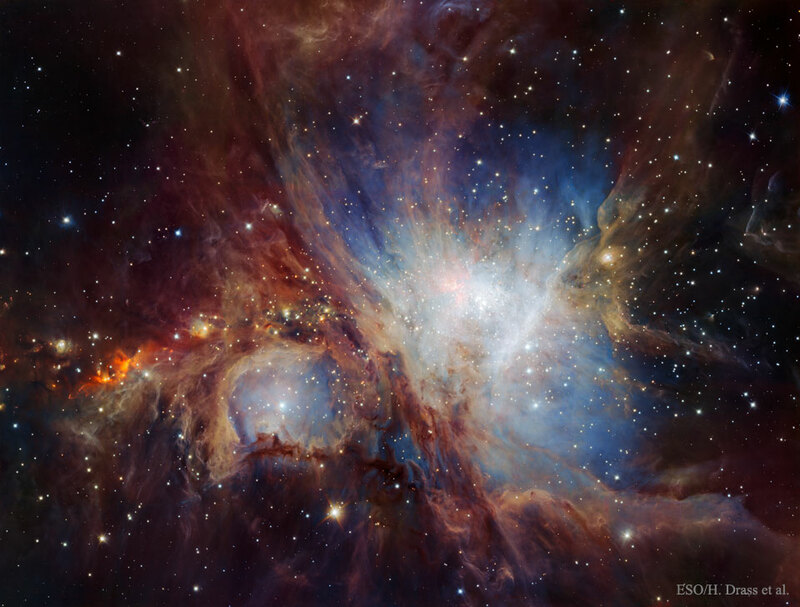 One can peer into Orion's pervasive dust in infrared light, as was done again recently with the sophisticated HAWK-I camera attached to one of the European Southern Observatory's Very Large Telescopes in the high mountains of Chile. High resolution versions of the featured infrared deep image show many points of light, many of which are surely brown dwarf stars but some of which are best fit by an unexpectedly high abundance of free-floating planets. Understanding how these low mass objects formed is important to understanding star formation generally and may even help humanity to better understand the early years of our Solar System.